We are excited to announce that we will be hosting a 50K Trail Run in 2019 at our Newest Venue, the Ocoee Whitewater Center! In addition to the 50K, we will also offer a 13.1 mile and 7 mile trail race for those not quite up to a 50K yet. The race begins and ends at the Ocoee Whitewater Center. To enter the venue in the morning, you will need to actually drive past the Whitewater Center on US 64 and enter from the far end of the parking lot. It is $3 per vehicle to park, which can be paid at the USFS kiosks when you arrive. Once you park, walk across the bridge and make a left towards the picnic shelter, which is where check-in will be. PLEASE NOTE THERE IS NO OVERNIGHT PARKING AT THE OCOEE WHITEWATER CENTER - SEE CAMPING OPTIONS BELOW. ALL TIMES ARE EASTERN TIME ZONE! 4:00 pm to 8:00 pm - OPTIONAL Race number and t-shirt pickup at Whitewater Center Pavilion for those who are staying locally the night before. Please Note: There is no race-day registration or distance changes. All registrations, distance changes and transfers must be completed by April 24th. If you have questions or need to speak with the Race Director, please contact us sooner rather than later, as we most likely will not be able to get you an answer if you wait until the day before the race. Awards for each race will be presented near the finish line when the top 3 finishers in each class have crossed the finish line. The Ducktown Copper Inn is conveniently located within 5 miles of the Ocoee Whitewater Center and offers a solid deal for a simple stay. After purchasing the hotel April 2018, the new owners (Jerry and Marsha Hauck) have renovated rooms, added new mattresses and linens to create a comfortable place to rest. There is also a pavilion area with a charcoal grill and fire pit to enjoy and share stories of your adventures. There are 4 rooms with a king bed, and the rest have 2 queen beds. All rooms have a microwave, small refrigerator, A/C and WiFi. $69.00 for first floor rooms and $65.00 for second and third floor rooms. All rooms are accessible by stairwells only. For both cyclists and runners that are racing there will be a continental breakfast included on their race day. You can book now by visiting www.theducktowncopperinn.com or call 423-496-5541. Please note in the message box if you want a continental breakfast online or let them know when you call. Mountain Escapes Cabin Rentals is offering 15% off on 3 night cabin rentals or 4th night free for 4 night rentals. Call 877-537-2273 to book and take advantage of discount. The nearest camp ground is the Thunder Rock Campground. Thunder Rock Campground is located 1.8 miles northwest of the Ocoee Whitewater Center, just behind TVA Ocoee Powerhouse Number 3. Nestled alongside the Ocoee River, this facility provides 37 regular campsites and one group campsite. Sites are first come-first served and camping is an additional fee that can be paid at the USFS kiosk at the campground or you can RESERVE YOUR SITE ONLINE. (HIGHLY RECOMMENDED AS THESE FILL UP!!) There are bathrooms and showers here, but no hookups. If you are bringing an RV and want full hookups, the Parksville Lake Campground is a few more miles west on US 64. You can RESERVE YOUR SITE ONLINE HERE for Parksville Lake. There is also The Ocoee Inn 5 minutes from the Ocoee White Water Center as a lodging option. If you have a large group coming from out of town, there are a variety of AirBnB or VRBO homes that end up being good deals when split among a group. Search near "Ducktown, TN" when you visit those websites. 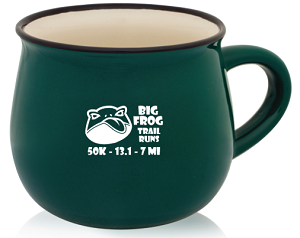 All runners will receive a super comfy cotton blend tee and commemorative mug. 2019 Shirt and Mug Design! The shirts are soft, lightweight and are likely soon to be your favorite. These are available in unisex and ladies sizing. Ladies shirts are v-neck, more fitted and longer...if you like a relaxed fit, order a unisex or size up in the ladies shirts. Please register by the April 13 shirt size deadline to guarantee your size. 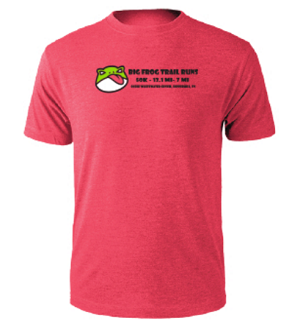 We will order a limited number of extra shirts for late registrants, however sizes are first come-first serve as you register. You will receive a Mountain Goat Logo Shirt if you register late and we have run out of race specific shirts. For the 50K race, we will have two categories - Male 50K and Female 50K. Top 3 Overall Men/Women in the 13.1 mile race will receive prizes and medals. Top 3 Men/Women in each age group in the 13.1 mile race will receive medals. Handmade finisher award for all 13.1 mile race finishers. Top 3 Overall Men/Women in the 7 mile race will receive prizes and medals. Top 3 Men/Women in each age group in the 7 mile race will receive medals. Typical Aid Station Fuel: Water, Hammer HEED, drop bags, soda, Hammer Gel, granola bars, Rice Krispy Treats, fig bars, peanut M&Ms, Skittles, Cookies, Bananas, and Endurolytes. Click on the "Race Course" Tab on the left to see mileages and locations of the aid stations on each course. 50k runners are welcome to have support crews, however they may only meet and assist runners at aid stations and must not interfere with other runners on course. Crews may need to park a distance away from the aid stations and walk as parking is limited in some areas. Crew vehicles cannot block ANY roads. Sorry, no pacers or other unregistered runners on course. 50k runners may send a "drop bag" that is one gallon-ish size to Boyd Gap (Mile 9) and Chestnut Mountain/FS 221 (Mile 20.3 and Mile 27.6). Poles are allowed - use them if you find them helpful. No Transfers after 4/22 - NO EXCEPTIONS. No category or distance changes after 4/24. Once your registration is processed, there are no refunds. ENTRIES DO NOT TRANSFER YEAR TO YEAR NOR DO THEY TRANSFER TO OTHER MOUNTAIN GOAT ADVENTURES EVENTS. If you get hurt or need to bail at the last minute, that is a major bummer, but we still need to pay the expenses associated with you racing regardless of whether or not you are able to attend. To help you out with this, you may sell your entry to someone in the SAME EVENT without penalty (meaning no transfer fee) until April 22nd. You are responsible for finding someone to buy your entry as well as arranging payment with that person. Once you have all that squared away, please email lisa@mountaingoatadventures.com with the contact info for the person buying your entry, and I will send them a link to register. The person buying your entry will receive whichever shirt size you originally ordered. If a natural disaster requires cancellation or postponement of the event, you will receive a pro-rated refund based on how many race expenses have been paid up to that point, and given the opportunity to pick up any race swag that has been ordered. The Race Director reserves the right to cancel or modify segments of the event as deemed necessary for participant safety. Once the race has started, no refunds will be given due to delayed start or early conclusion of the race.